Apple’s new MobileMe service, which will allow consumers to sync their mail, calendar, contacts, and other content across their phone, personal computer, and any other device which can access the web, has been been called “The Most Interesting part of this year’s WWDC” and heralded by some to be poised to “Crush Exchange and Google.” While the enthusiasm for a clean, integrated connectivity service is understandable, it exaggerates the willingness of consumers to pay for a service that, while imperfect in its implementation today, is almost entirely available today FOR FREE. I don’t believe that MobileMe adds enough incremental value for consumers to be willing to shell out $99 – $149 per year for the ability to do what they can already. MobileMe is a service that is too expensive and too late. Seamless connection of email between mobile and web? Try Gmail and its handy mobile application for the iPhone and Blackberry. Seamless connection of calendars? Try Google Calendar and Google Sync for mobile, which smoothly integrates into your Blackberry. Photos hosted on your desktop and online? Try using Picasa Web plugins for iPhoto, or the Picasa application for PCs. Getting this kind of functionality today does require that users plug the pieces together on their own. And it isn’t necessarily perfect. Admittedly, some of the features offered by MobileMe are not offered elsewhere – at least that I know about. For instance, constantly synchronized filing and sorting images and files (if I merge two albums in iPhoto, after both have been uploaded to Picasa Web, I have to duplicate that action on the Picasa website) and synchronized contacts (my BlackBerry integration with Lotus Notes or Outlook is perfect, but MobileMe, which is positioned as “Exchange for the rest of us,” is clearly targeting users that have neither) are both new and useful services, but are not justifiable at this price point. 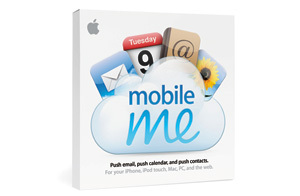 Apple announced its new MobileMe service yesterday at the WWDC in San Francisco. The service is not yet available on Apple’s website (you can currently only sign up to be notified when it is ready), so I can only speculate as to its full functionality. MobileMe will replace its existing .Mac service. Given how weak customer enthusiasm had been for the original .mac service (which I also feel is largely due to its price relative to other offerings from Google and Yahoo), however, MobileMe’s heritage isn’t exactly a bragging right. What do you think? Are MobileMe’s features enough to win consumers over? Will they be willing to fork out $100 for features that can essentially be pieced together for free online today? Everybody has a skewed perception of how much technology infrastructure costs now because of google. but this is not valid argument. The truth is, technology is expensive. And i am extremely surprised apple can offer mobileme as cheap as they do. The only reason google is free is because google is datamining your information. With google you aren’t getting a “Free” service. With google YOU ARE the product. I don’t know about you, but I’m going to steer clear of “Free” services.